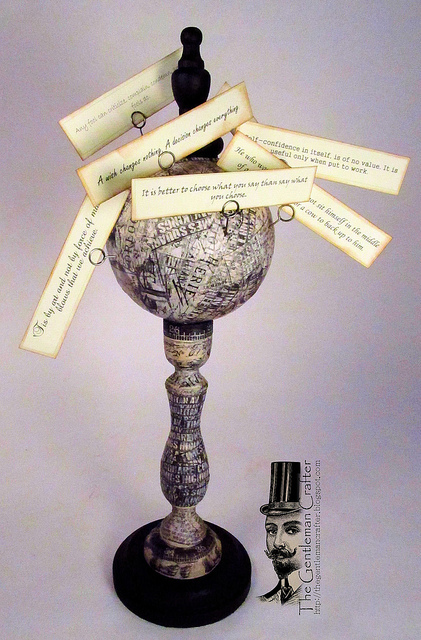 The Gentleman Crafter: Quote Sphere! Hope your weekend is off to an amazing start! Mine has been really weird! LOL! Friday night I was crafting away like I was a factory! Saturday, I had lunch with some friends and then decided to rest for awhile....Well, to be totally honest, I stepped into my studio to turn on the light last night and then once again to turn it off! LOL! I think I just needed the rest. But let me tell you, I had the best time ever! I sat and watched glass blowing on Youtube from 2:00 p.m. until about 12:00 p.m. I have always loved to watch glass blowers at different places I have been and I have no idea why glass blowing today. I just couldn't get enough of it! Hahahaha. It just amazes me. I don't think I would ever really like to try it, but I so enjoy watching people do it. LOL! Beyond the supply list shown above, I purchased a 4-inch wooden plaque, a 6-inch wooden candlestick, a finial, a wood wheel for the finial to sit on and a 4-inch styrofoam ball. I have added links for each in case you can't find them in your local craft store. I nipped off the tenon (The peg like piece at the bottom) from the finial with my Tim Holtz Tonic Scissors and glued the finial to the little wheel and allowed to dry. (You can skip this step and just insert the finials tenon directly into the styrofoam if you choose.) I then painted the final piece with Ranger's Adirondack Pitch Black Paint. Next, I painted the wooden plaque with the black paint. and allowed to dry. I pulled out all my Tim Holtz Tissue Tapes and chose to cover the body of the candle stick with the black based tape. I just went around the stick taping and tearing until I had covered it. I used the lighter tapes for the top and bottom and accented them with the black tapes. 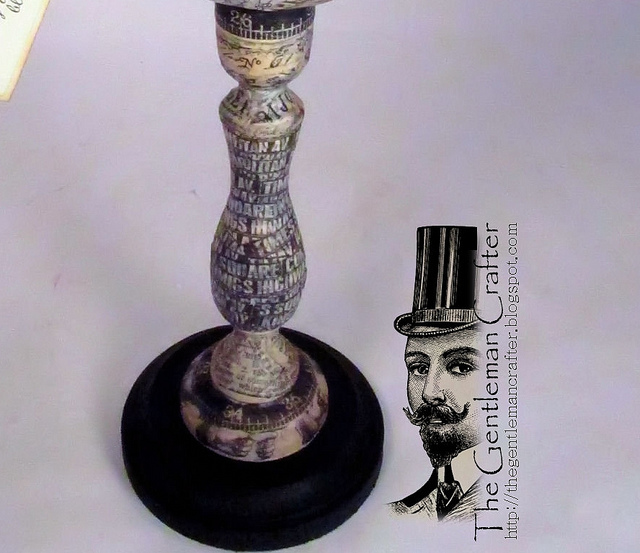 Once that was done, I added Glossy Accents to the wooden candlestick and adhered it to the base. I then took the tape and went around the styro ball in full circles, overlapping as I went. I did this until he ball was covered. I glued this to the top of the candle stick. I flattened out the top of the styro ball a bit for the finial. once it was flat I adhered the finial piece to the top. Next came the matte Glue 'n Seal. I covered the entire piece with the Glue n' Seal to hold the tape in place as well as coating the wood for ease of dusting. Once the Glue 'n Seal was dry, I went over the taped areas with Vintage Photo Distress Ink. 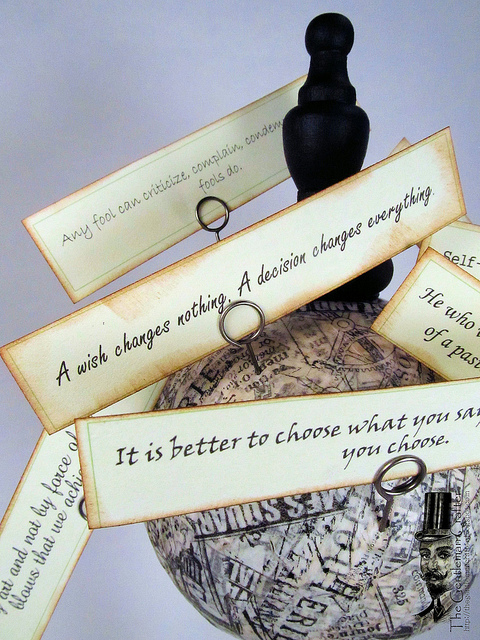 Last, I printed out some favorite quotes on the computer, cut them out and added them to the Quote Sphere with Tim Holtz Memo Pins...Done! Such a graceful shape..and a great concept. You are on a quote tangent right now! LOL I love it! Love this Jim, I love the idea of using quotes. Fab! OMG! Love it! You always inspire me with something unexpected! This is SO neat! I'm going to have to do something like this for my sister. She loves quotes and this would be something perfect for her work desk! Thanks so much for the inspiration!! How do you think up these different projects?! I love this - it's so unusual. Love it. Pinned to the board I have dedicated to your work! Gorgeous project !!!! I'll give it a try myself!! I like it! Would be perfect to make for my college age daughter. Thanks for the idea Jim. Once again you've come up with a cool project...love it! Thanks for sharing!! Neat idea... I live that your projects are functional ! Wonderful idea for a teacher at the beginning of the school year. Thank you for your inspiration for a summer project! Inspired and inspiring Jim. I so want to make one of these. Might have to be just a touch more girly ;-) Thank you for sharing. Dusting???? Will someone explain dusting??? Seriously a wonderful project Jim. That is incredibly creative and versatile too, Jim. Love the combination of all those elements and the end result. Nicely done!! So amazingly cool looking....I'm going to have to give this a try! Thanks for the inspiration! Cool project Jim! I am also fascinated with glass blowing and a year ago was in New Orleans and took an afternoon to take a class. It is hard hot work and I can pretty safely say not one I will ever be good at. But so glad I took it so I now have a lot more appreciation for that art. a wonderful piece of art....a piece that would be well talked about; the tutorial's so well written, as all yours are; thanks for sharing & I *just may have to* give this a try.